After rock climbing this morning and a break for lunch, the 6th graders went to their daily Discovery session. The first activity involved everyone writing their names on mirrors. Then the campers got to choose someone else’s mirror and look at their reflections together through the shared mirrors. Finally, they got the place their mirrors someplace on a world map that is meaningful to them. Maria placed hers on Canada because she would like to visit family there. Ariel placed his on Japan because he wants to practice the Japanese he’s been studying. Maya put hers on Thailand because she would like to visit there someday. We learned a little more about each other based on where each person placed their mirror. The next activity was to trace over the old city of Jerusalem and the existing four quarters: the Muslim Quarter, the Jewish Quarter, the Christian Quarter and the Armenian Quarter. Each camper got to reimagine what the city layout would be if they could design it. Many of the campers intentionally included a place in their city design where everyone could be together. For some it engulfed the whole city and for others they added a “peace quarter” for that purpose. 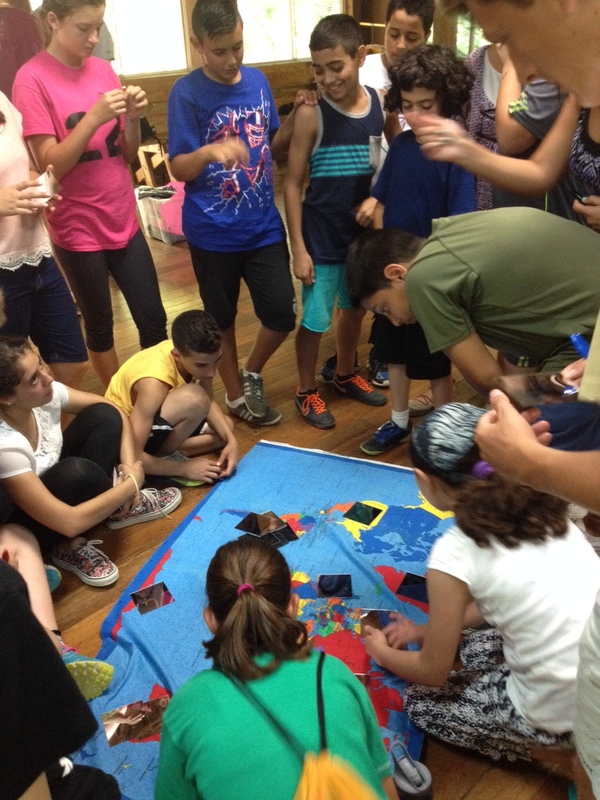 After discovery the group got to learn outdoor survival skills from the Camp Bob staff before a Faith Advising session led by Adli, Jerusalem Muslim Faith Adviser and Yair, Jerusalem Jewish Faith Adviser. The kids had so much fun playing games to get to know each other better. Working off of the mirror theme, one activity involved sitting across from partners and mirroring their actions. We talked about how difficult it can be to do exactly what someone else is doing, but also how fun it is to see things in a different way. After dinner, we joined the LEAP group for a talent show. We had a few performances from both the 6th grade and LEAP as well as all of the counselors and the LEAP Faith Advisers. From music to cultural dances and skits, it was the perfect way to end the day together.